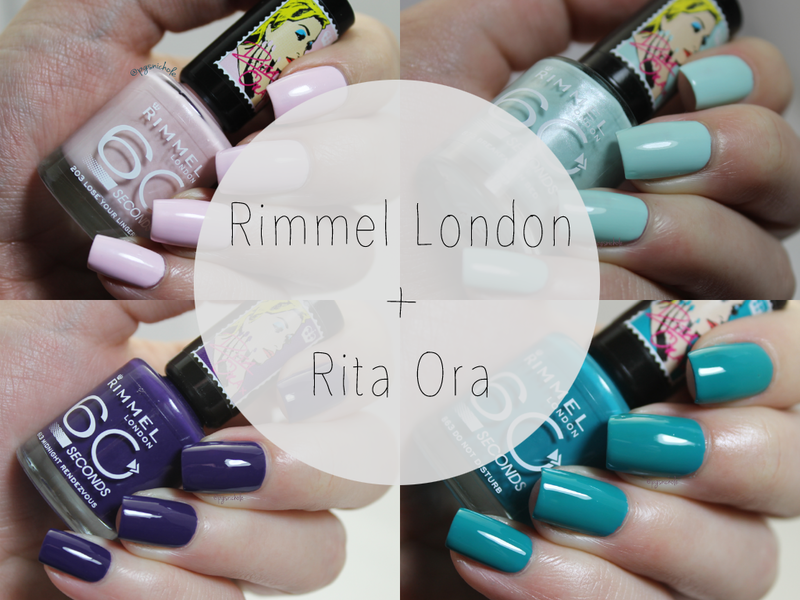 I was lucky enough to be offered a chance to swatch a few shades from the Rita Ora for Rimmel London collection. It is my first time swatching for a mainstream brand, and it was definitely a little different than I am used to...but who am I to say no? First up is the delicate baby pink cream/pearl Lose Your Lingerie. I was hoping that this one would have been better than it was. 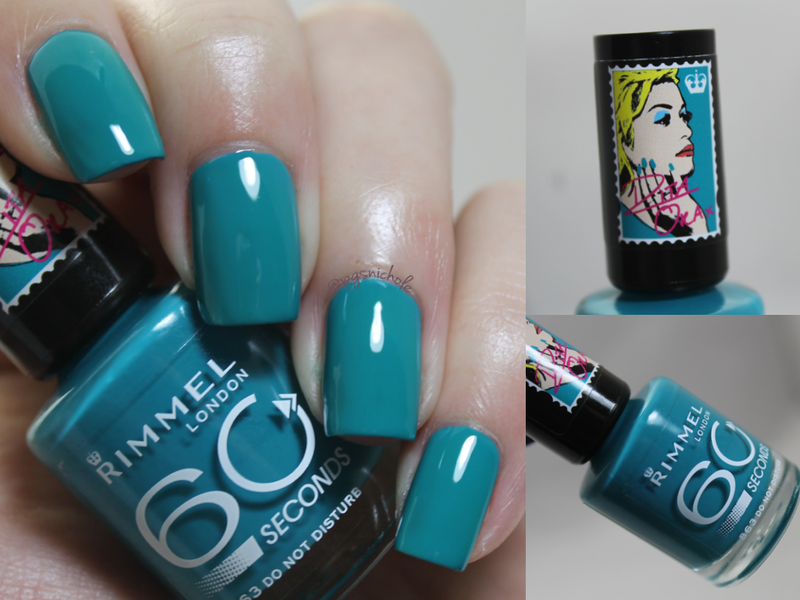 Most of the Rimmel quick-dry polishes I've used have been pretty decent...though I have never tried the lighter colors. This applies, sadly, like most pale/white colors I have tried. I needed three coats to cover the streaks. 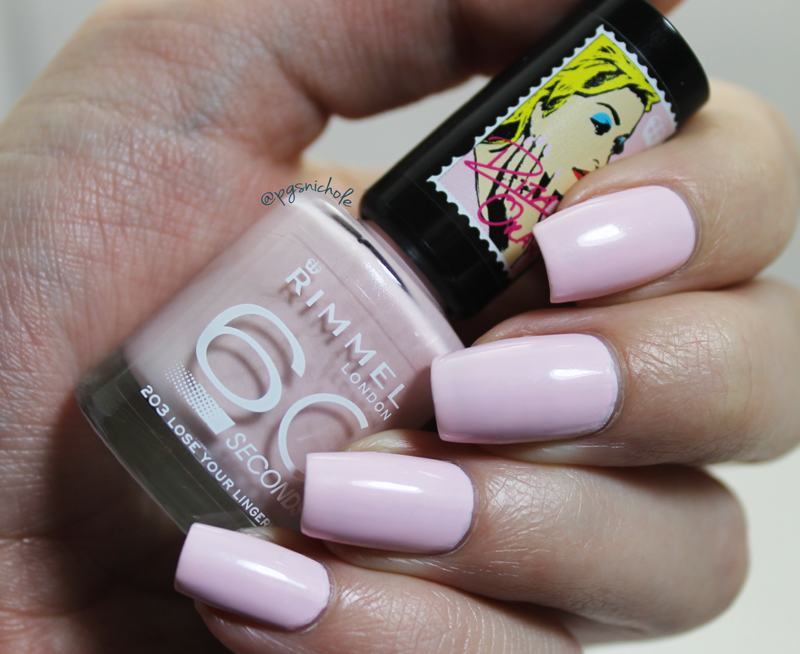 I was also pretty sad that the lovely ivory pearl in the bottle doesn't translate to the nail. :( But it is a pretty color, and for under $5 you would be hard-pressed to do better in any drugstore. I have a soft spot for minty shades like this. I do. I love them. I don't buy near as many as I would like to, but they are always the ones that draw me in. After the thick misery of Lose Your Lingerie, I decided to thin this one. It helped a good deal...but I still didn't get a good opacity in under three coats. This one also lost a bit of the pearl, but not as bad. These creams are where this particular line shines. I needed two super thin coats here, but I probably could have gotten away with just one if I wasn't taking pictures. 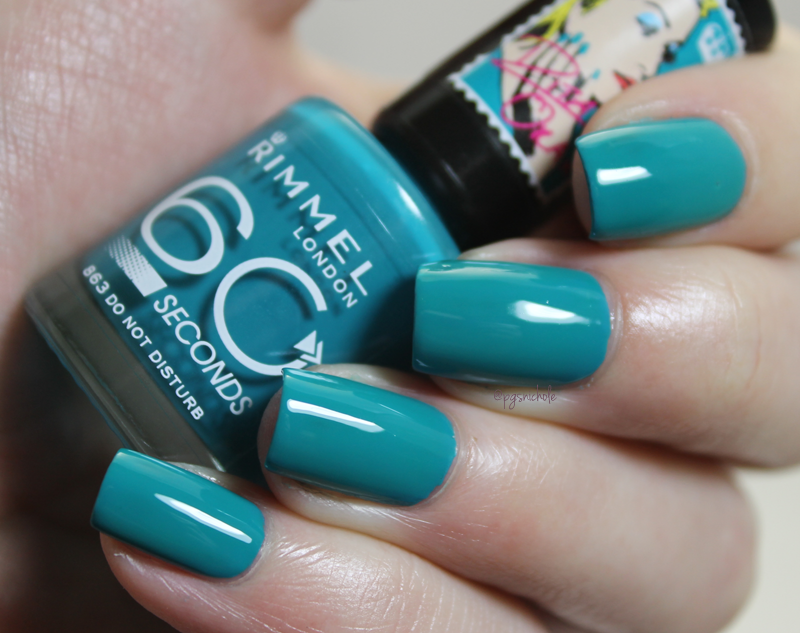 I loveLOVElove this color. 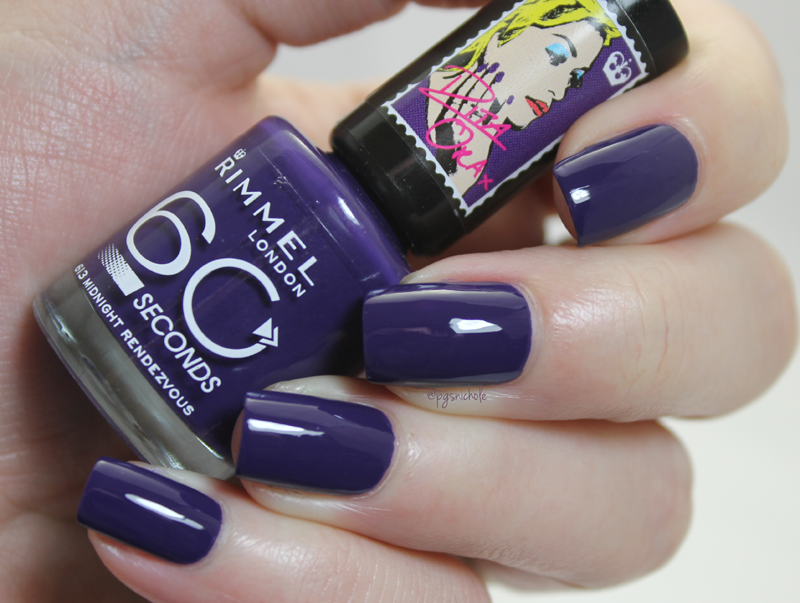 It is the perfect cool purple for Fall and Winter. If you only grab one of these four, make it this one. I was so excited to see this color. Teal is (obviously) one of my favorite colors. My grandmother's house is teal, btw...so it might be a family trait. This color was a two-coater, which I honestly don't mind. It dries fast and is glossy without a top coat...speaking of top coats. WTF is going on with mine? I dunno if it is this particular shade, or my new-ish top coat/base combo...but this shade yellowed. In person, before the topper, it was completely true-to-bottle. Once I applied the topper...sadness fell upon me. Ultra lame. I guess this is what I get for trying to apply "use it or lose it" to my polish collection. So what do you think? 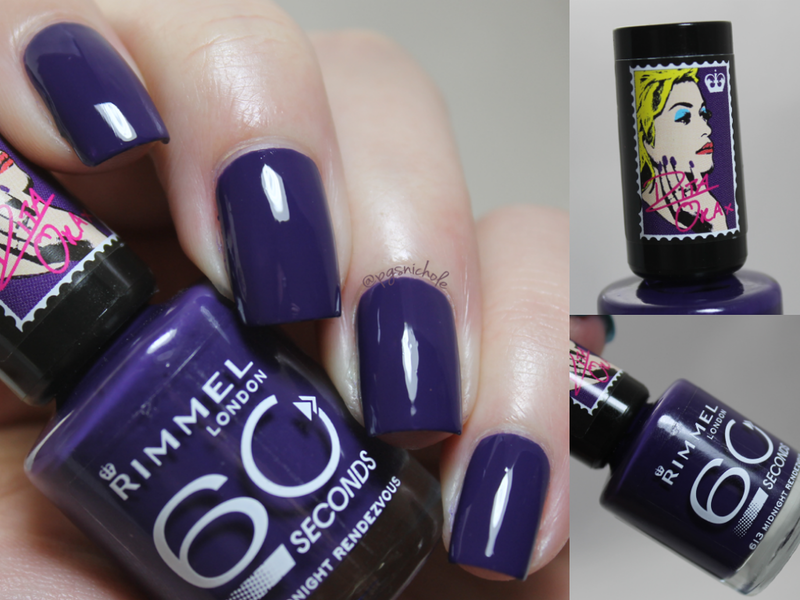 Rimmel is one of my favorite drugstore brands when it comes to polish (and eyeliner, but that is for another time) so I was doubly excited to swatch these. I think my favorite is definitely Midnight Rendezvous...though even with the top coat shenanigans I love Do Not Disturb.